Paris, Rouen, and Le Havre are stops on Seine River cruise itineraries in France with top excursions going to, Giverny, Honfleur, Versailles, and D-Day beaches in Normandy. Luxury riverboat cruise vacations in Europe are booming with the Seine in Northern France an increasingly popular destination. Cruises on the Seine are commonly a weeklong with Paris usually the top destination. Further popular stops on the Seine include Rouen in Normandy (Normandie), Conflas (for excursions to the Palace of Versailles), Vernon (excursions to Giverny), Les Andelys, and Caubec. Many cruises continue to the lower parts of the Seine River with stops in Honfleur and Le Havre – both well located for excursions to the coastline of Normandy, the Bayeux tapestry, as well as the D-Day landing beaches and related Second World War monuments. Cruises on the Seine are typically weeklong return trips from Paris although a few vacations are one-way between Paris and Le Havre allowing for more leisurely sightseeing en route. The cruise season on the Seine is mostly from April to November but an increasing number of cruises are also available during the Christmas and New Year period. Cruise prices vary surprisingly little in different seasons although discounts may be easier to obtain in quiet periods. Most Seine cruises use Paris as the port of departure and / or arrival. During winter, short two or three-day cruises never actually leave French capital (although the boat may make short city cruises). Riverboat passengers can take many excursions to see the highlights and nightlife of Paris. However, Paris is easy to explore with excellent public transportation allowing for very cheap do-it-yourself travel. Many Seine cruises stop just downstream of Paris at Conflas for excursions to the Palace of Versailles. However, it is also very easy to explore the Chateau and gardens of Versailles on a day-trip from Paris using public transportation. The house and gardens of impressionist painter Claude Monet in Giverny is a popular sight for both passengers cruising on the Seine and day-trippers visiting from Paris. Boat passenger excursions usually depart from Vernon or Mantes la Jolie. A major attraction of Monet’s garden is of course the water lilies – in Paris see some spectacular water lily paintings in the Orangerie in the Tuileries gardens next to the Seine and Place de la Concorde. Les Andelys is strongly associated with English king Richard the Lion Heart, who was also feudal duke of Normandy. The ruins of his twelfth-century fortress Chateau Gaillard tower over the town and have grand views of the Seine Valley. The top sights in Rouen, the historic capital of Normandy, are Gothic architecture including the Notre Dame Cathedral (famously painted by Monet), the Palace of Justice, and the Gros-Horloge clock. Joan of Arc was burnt at the stake in Rouen. Caudebec-en-Caux is a romantic little Seine town mostly visited for its Gothic Notre Dame church, the nearby town Villequier with its half-timbered houses, and the Benedictine Fontenelle Abbey at St Wandrille. Le Havre is a major seaport at the mouth of the Seine River. The historic town was severely damaged in 1944 but rebuilt with its modernist architecture showing such a remarkable degree of homogeneity (as apposed to beauty) that Le Havre was added to the UNESCO Word Cultural Heritage list. Honfleur, at the mouth of the Seine across the river from Le Havre, has a marvelous historic old town with seemingly endless, picture-perfect half-timbered houses. Second World War sights including D-Day Beaches and War Cemeteries are best reached on excursions or other organized tours as public transportation is somewhat inadequate. Other popular excursions go to the white cliffs of the Atlantic coast of Normandy, the Bayeux tapestry, and production facilities for local products including cider, Calvados brandy, and Camembert cheese. 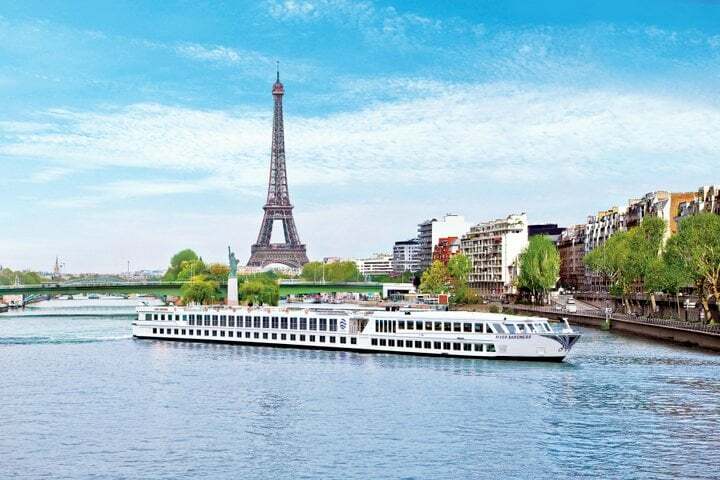 Luxury Seine River all-inclusive cruises sold in the international, and especial North American markets, by holiday tour operators such as AMA Waterway, Avalon, Globus, Tauck, Uniworld, and Viking River Cruises often include additions at the end of start of a cruise, e.g. a side trip to the chateaux of the Loire Valley, longer stays in Paris or Normandy, or a further cruise on the Rhone and Saone rivers in the south of the France.